About straight lines, i do like PS's [Shift] axis lock ... i use it all the time, actually drew these feature request .gifs of mine with it. It's nice because it's monitor space X and Y lock, so if you want an angeled straight line you rotade the canvas by the right degree. ROFL ...I keep forgetting that, too!!! ...damn virtual brains! Called: "Field Day," of course. Everything was done with a mouse! and it's kind of a 'campy' piece, but I'm using it as the cover to the next radio club newsletter. There were a few bad issues I ran into when I made too many layers including losing the ability to 'undo' and things getting really slow. I ran into a problem where occasionally, a brush with a bias would paint a circular thing instead of a crescent, and also when pushing the space bar to change brush sizes, the brush would sometimes put down some paint. I'm really happy with it!!! Thank you Taron! OMG, Mike...that's INSANE! .... WOW! And the mouse thing should be made very, very, very known, because that is truly impressive on top of a truly impressive piece of art, easily transcending the cartoon aspect! Sorry about the troubles, of course. I wonder, if the latest version helps or makes some things worse, but I count on you letting me know! I will have to optimize the memory stuff altogether. It's just not fully clever, yet, when it comes to layers, but I already know partially what I can do and it should have a massive effect on folks, who like using loads of layers. Wow that last piece is EPIC!!!! You surely put a lot of time on it and it shows. What makes it even harder to believe is that you used mouse! @. @ Just wow! Cool that the cloning worked out for you, in the end! Though, you still gave every part a little unique touch after all. Thank you Dm7 & Jim!!!!! Your kind remarks have made my Friday! Next weekend is the big event where 45,000 hams across the US and Canada amongst 4000+ clubs will participate in a two-day event where emergency power only stations set up out in the fields, mountain tops, church yards, state emergency operations centers, boats cars, etc, to get 'on the air' for a hectic 24-hour radio contest. 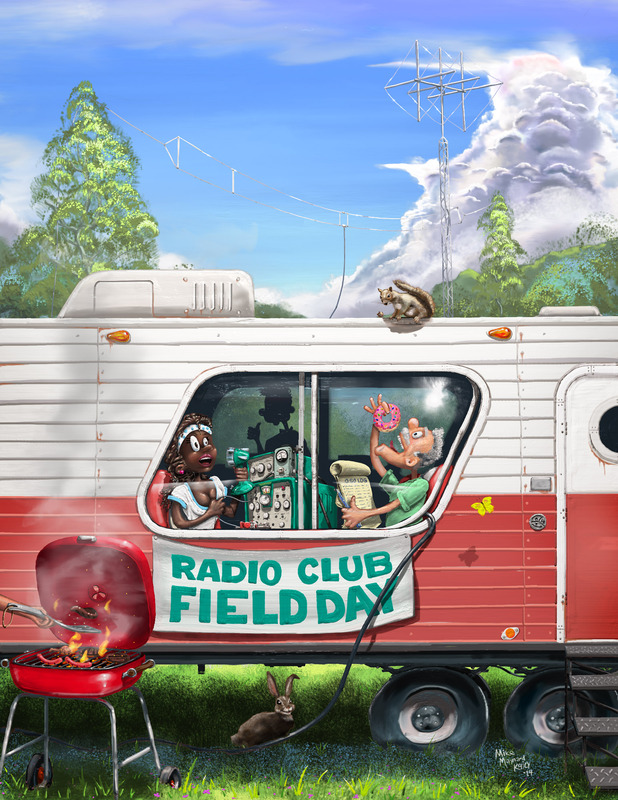 I coordinated our ARRL Field Day event for 6 years and I can say that the joys poured into this image were inspired by my experiences. People you would only know by voice tend to pop up, the food is always awesome, and you get to play with plenty of high-tech toys. What's great is that you often get mingle with public officials, get to be on the news, and in the paper. Yup, the image will be shown two weeks from now, so I'm curious to see who notices. OK Until a few years ago, I had a 12" Wacom tablet at work! I gave it away! It had a swivel button on the stylus and I rest my pencils and pens on my ring finger instead of the middle finger so it was too awkward to use. Do they still have buttons? ??? Ohhhhhhh, do I soooo regret losing it - I really envy pressure and angle input. I've been drawing with a mouse for over two decades, so the dexterity is preeminent. All in all - what a 'selling point' for Verve! Even mouse-bound artist can create amazing masterpieces. Alas Mike there are functions inside Verve who are only accessible by the pen graphic !